I switched to Cent Browser from Chrome mainly because of the bad design decisions, but also because Cent is way more configurable. Thanks for that. There are hundreds of files changed behind this flag. So it is hard work to bring it back. There is no need for excuses, since this is not your fault, but a fault of the Chromium developers, that do awful design, UI and UX decisions. Common guys, did this "stupidity bacteria" also start gradually eating my favorite and the most fantastic of all times Cent Browser? I was really sad to see the top-chrome-md's normal flag gone in your latest update... Do not copy all the dumb stuff from Google, Microsoft, Skype (owned by Microsoft now too), and all the other feeble-minded participants of this category. Let your happy users to decide which options to go for, do not decide INSTEAD of us! Let us choose, do not FORCE it, like Google Chrome does, see the difference? I think you are aware how many billions of users are on Cent only because of this "old chrome design" aren't you? I hope my favorite Cent will not copy-all-the-crap from Google-Chrome one day and will not change its name from Cent Browser to Google Chrome 2 or something... Although it pains me to see the first contamination signs of this bacteria I am sorry to say, but the sooner the treatment starts the quicker and easier it will be cured. Keep your Cent Browser as great as it has always been, do not ruin it! What did I write in my opening post? But this is not an acceptable solution for a longer time, since security relevant bugs are not fixed when staying on an older version. You may try changing "Tab shape" in chrome://settings/appearance to "Square". They're both ugly, but I actually think the square option is the worst out of the 2 cause it makes the tabs more indistinguishable from one another. The rounded one at least creates a tiny space on the upper part between tabs. Of course, doesn't compare to the trapezoid tabs. If can't bring back the trapezoid tabs, I suggest Cent developers try to make more parameters of tab bar available for user configuration. For example, padding around favicon and close button, height of tabs, the width of white space at the right of the newtab button, color of close button when hover, etc. (02-02-2019, 04:17 PM)CentBrowser Wrote: So it is hard work to bring it back. Do you work on bring it back definitely but it is hard OR It's hard and we will not bring it back ? 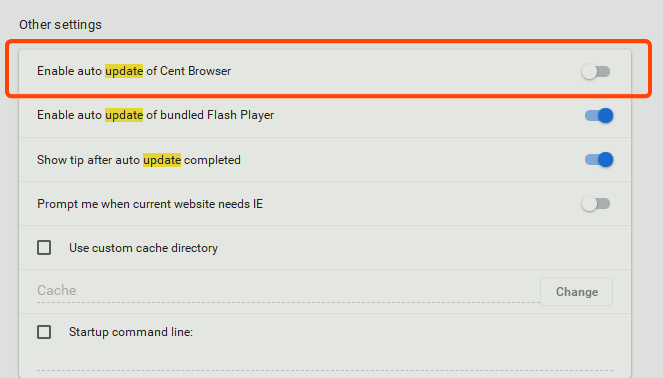 https://www.centbrowser.com/forum/showth...p?tid=2427 Works great or 3.7.2.33, but how to off updates? Not fully worked for me, its just forced update today can i ask IP server to block updates?